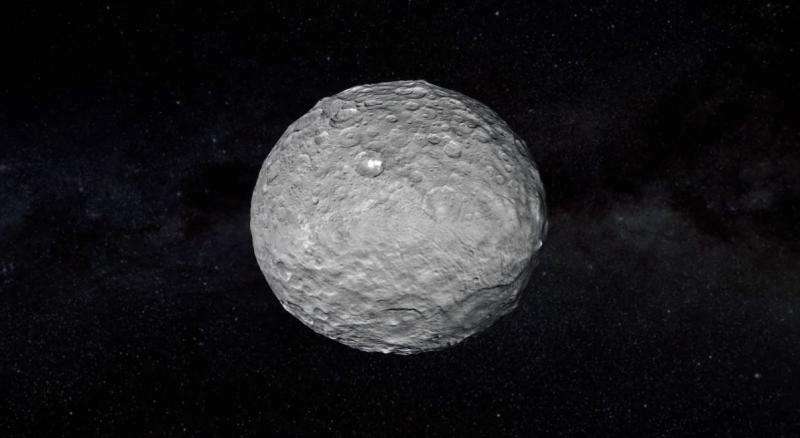 Ermakov and his colleagues' research supports the possibility that Ceres is geologically active—if not now, then it may have been in the recent past. Three craters—Occator, Kerwan and Yalode—and Ceres' solitary tall mountain, Ahuna Mons, are all associated with "gravity anomalies." 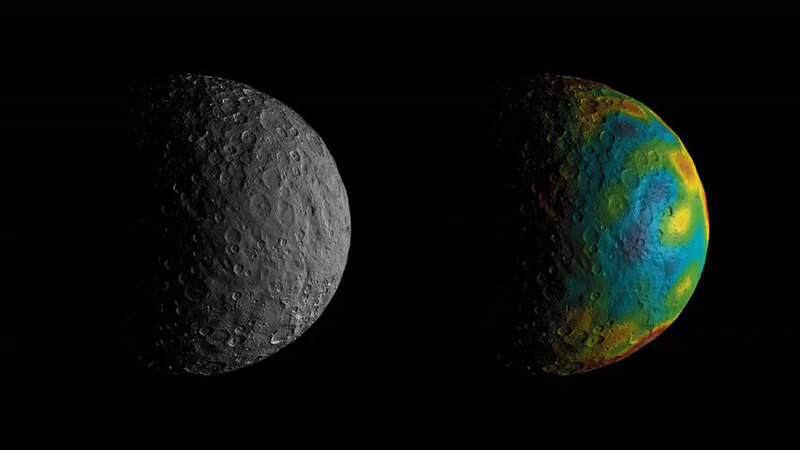 This means discrepancies between the scientists' models of Ceres' gravity and what Dawn observed in these four locations can be associated with subsurface structures. Wouldn't it be exciting to actually explore Ceres in person?! MT, better thee than me. But what the heck, we all gotta die sometime. Yours could be epic level painful and degrading. As long as you make the headlines...Right? And get that footnote in the history books to boot. Gotta keep our priorities, for our life expectations, straight. Probably active laser/phaser/other type beam defenses on Ceres.....main reason for 'reluctance to land there'!! If YOUR people had an industrial/defense/research operation there of a proprietary/security/military nature, would you defend it our just fade quietly away? No real way to totally leave there, as the installations maybe there for a long time, and alternative housing not ready quickly.... Or maybe something really valuable in/on Ceres and mining/processing/whatever operation will proceed. If Ceres is a staging area for military expeditions, then further surveillance will be required and a 'cover story' for a HUGE budget will BE necessary. That is budget in lives as well as equipment/materiel, etc. No reasonable earth alliance no matter how secret will be able to keep this secret for more than ten milliseconds after attacks on Earth begin. No person above the IQ of idiot with an AK to his head will really believe the 'salt reflection' story. MT... exploratioin of Ceres best done initially just like it was first done... Quietly with a small probe sneaking out of the cold black of space with nary but the faintest glow of impulse electric thrusters. To physically explore it for caves or other means by which WE could live on an energy poor budget... no fusion reactors, no artificial gravity units, no electronic field shielding like the recent discovery will take the use of caves large enough to park surface transport. Ceres' natural gravity low, so probably Shawer drives would do, but Shawyer's stuff has new British patents now and with Chinese help too probably work better than most assume. We would need a true exploration ship, no less than 5,000 tonnes and crew of over 100 with landing bays, ag bays, machine shops, water and air treatment/recycle plants.... and... Shawyer powered SHUTTLES with airlocks and cargo holds. Ship must carry stuff to support live in colony for a year, include medical and dental, etc. CS, you made some very good points. However, my peeve is with the guys who are commenting on the subject of exploration. None of them are going to risk their flabby, white asses on those expeditions! None of them are making any effort to invent, develop or manufacture the protective technology needed for manned flight. Specifically making possible a real, self-sustained gravity field. And an energy field that collects and directs the extreme radiation beyond the Van Allen Belts. Both of those physical inventions are absolutely needed for any long-term Human presence away from the Earth. Every other attempt at a manned expedition is a complete waste of time and funding, until both those efforts are proven successful. some of us aint white though! with the type of risk involved, you will need cannon fodder, so why not use those who have nothing to give but their willingness to be guinea pigs? so, who better to test it on than the willing? It is exasperating (to me) how callous people can be towards other peoples suffering and deaths. When I see any of youse guys lining up to volunteer to be the 'guinea-pig'? I might have more respect for your opinions. First necessity will be an energy field that can gather and direct high energy radiation. Cause you don't want to bounce those accumulated cosmic-rays in the wrong direction. Such as, say ohh, a military defense satellite? I do not see any reason preliminary development and testing cannot be done Earthside. I admit, the ability to produce a Real Gravity field here on Earth would be a hell of a lot tougher. Unless some genius makes a really big breakthrough in theoretical sciences? The only realistic method I can foresee is by producing degenerate matter. Applied as layers of paint to build up to a one-gee effect. I suspect such a production facility would have to be in zero-gee orbit. Utilizing automated equipment and waldoes.